Dative Case | What is the Dative Case? 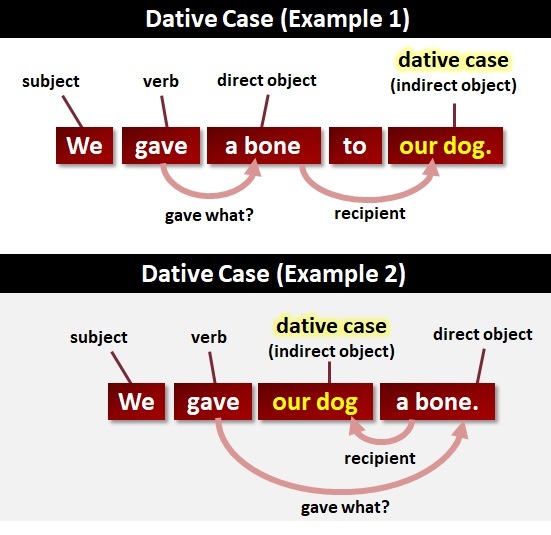 The dative case's main function is to show the indirect object of a verb. Most people will encounter the term dative case when studying a language other than English. She gave the postman a letter. Step 1. Find the verb = "gave"
Step 2. Ask "What?" = "a letter"
Step 3. recipient? = "the postman"
Therefore, the direct object is a letter. The recipient of the direct object is the postman. The words the postman are in the dative case. Luckily for us, nouns do not change their forms in the dative case. However, some pronouns do. Barney will send him the presentation tomorrow. Step 1. Find the verb = "will send"
Step 2. Ask "What?" = "the presentation"
Step 3. recipient? = "him"
Therefore, the indirect object is him. The pronoun him is in the dative case. It has changed from he to him. In English, we use the term objective case for the dative case and the accusative case. Particularly when studying other languages, you might encounter prepositions which take the dative case. For example, in German, the following take the dative case: aus, bei, mit, nach, seit, von, and zu. In these examples, the words her and whom are known as the object of a preposition. What is the direct object? What is the indirect object? What is the objective case? What is the nominative case? What is the accusative case? What are intransitive verbs? What are transitive verbs? What are pronouns? What are verbs?